USB to TTL PCB cost a bit of money : you can find some on Ebay around 7€ (shipped) and 15$ on Sparfun !!! That’s about 2 or 5 times the cost of the microcontoler ! In fact, USB to RS232 is a mass product, and the cost is really low. I decided to order a couple of this, just to look if I can use this stuff on a PCB. So I bought a 1.70$ USB to RS232 on Ebay. I decided to rip the plastic off the DB9 and discovered a really tiny PCB. I removed the DB9, and decided to pass this little PCB to a scope session. How the hell do they manage to do a USB to RS232 with only a couple of external components ? They is no big capacitor for level shifter (remember RS232 is a +12/-12v ) ? The answer is simple, they don’t !! This device isn’t RS232 compliant at all, the signals on the DB9 are TTL compliant, but not RS232. The ouput is between 0/5V and the input can handle -12/+12V but works great with a 0/5V too. I simply removed used pads on one side and added a couple on pins. Please note that RX pin is missing on this pix but needed of course. The next step : How can I use this with an AVR Atmega (I used a Atmega8 but any will do the trick). 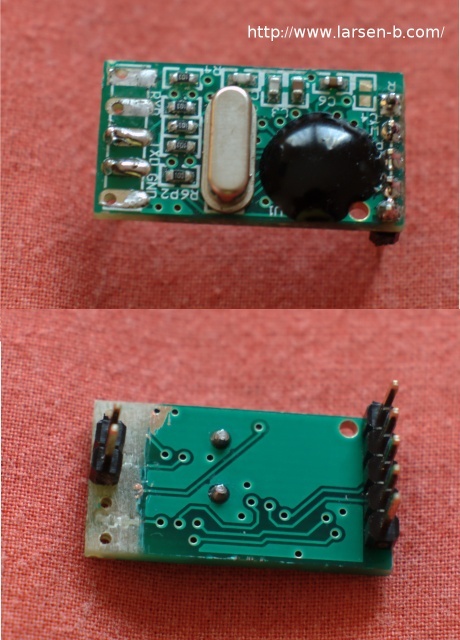 Serial connection on a micro is TTL like this board, but the TTL signal is just inverted. A “1″ on the RS232 side is a -12V and +5V on a TTL, and a 0 on the RS232 side is a + 12V and a 0v on the TTL. You can find all the information here. I simply put this on a verroboard, connect VCC to USB Vcc, GND, RX and TX to random pins on the AVR and let’s go to RS232 software serial. This can be done easily in fact, and I managed to handle 19200bauds with the internal 8Mhz clock of the Atmega. Above you will find the popular uart_putc() and uart_getc() .. Nothing more to say, this hack works really great, and I can now build a bunch of USB board without paying so much. The only drawback of this approach is that you can’t use an interrupt for the uart_getc() so you have deal with that in your code. Another approach would use a single transistor for the RX pin to make the RX compliant w/ the AVR serial builtin routine. 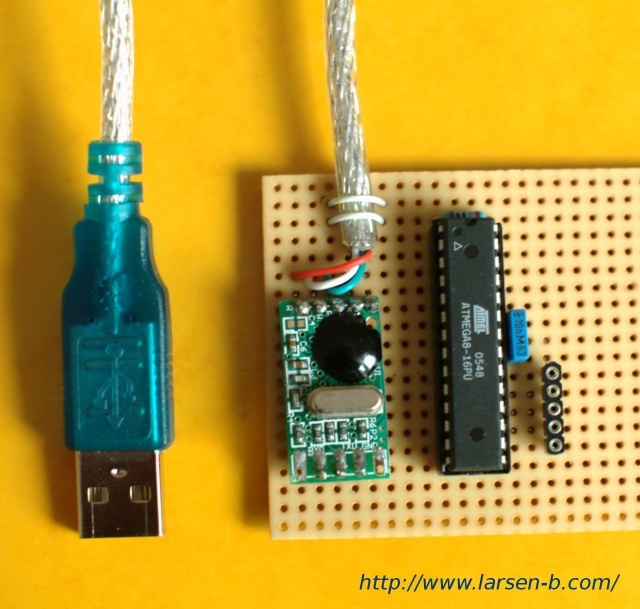 This entry was posted in Electronics and tagged atmega, avr, rs232, usb by admin. Bookmark the permalink. So is this essentially a $2 FTDI cable? Also, was inverting the bits the reason you couldn’t use the USART module? Have you thought about inverting your data before writing it to the register for serial data (the same after receiving data). I am not 100% sure but that might do the trick. No need for extra code or cpu cycles. The chip is not a FTDI but you can use quite the same way. yes, due to inverting bits, you can’t use the USART module. In fact, for sending this is not a issue, for uart_getc(), you are unable to use the interrupt. But that can be fixed w/ one transistor in between. Did you try to add one n-p-n transistor and two resistors for inverting signal? And Programmer’s Day to you! I have fought this inversion battle many times. a simple transistor+resistor will invert the signals easily enough. It does unfortunately add 4 components to the circuit. So how is it handled on the PC side? What drivers are needed? How does your PC application access it? 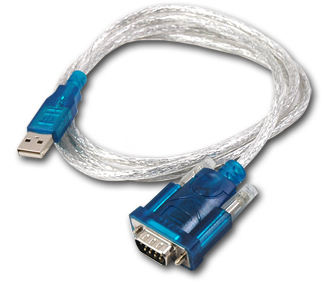 What vendor on Ebay did you get your USB-RS232 cable from? @Alex and @Gar, I haven’t found the time right now. But yes I NPN on the receive pin will provide a nice stuff. (inversion on the send isn’t a big deal) . @Madge: I used Linux, so no driver is need, works out of the box. Just read/write to /dev/ttyUSB0. For the ebay vendor, , don’t remember but every cheap (<2$) should work. What about using specialized inverter ICs? Do you have any idea what the two (or more?) extra pins are for? …any modem control lines? @bernt, I missed this comment (don’t know how). Yes simple inverter will do the trick. I don’t have some here so, never tried this. The other lines are standard db9 lines, so yes modem control ones. @Bob, I cut the plastic w/ a knife, and cut the db9 pins before. I’ve been playing with this for the last day, and I’m not having success. I found an identical looking cable, but the board inside is slightly different. Still, I identified the pins. I hooked RX and TX together, and using cutecom I am receiving exactly what I am sending each time, so I know the cable itself is working properly. Using your code on the AVR, I’m sending “a\r\n”, and that’s it. However, using cutecom I only see things like x00 repeated over and over. Is there something else that I need to do on the software side in order to translate the messages, or am I just missing something huge? This is the first time I’ve delved into serial comm before, so please be gentle. Newer PIC mcu:s have settings to invert the hardware USART, that is good because it can be used directly with the cheap USB-serial converters. is this cable compatibile with atmega328p?